Feeling deprived is not a good feeling. Often, people are turned off by the idea of paying off debt or reaching for a big financial goal because they want to have fun now and have a hard time seeing how much better things could be if they made some short-term sacrifices. It’s understandable but reaching for a big money goal does not mean that you have to be deprived of all fun! There are so many ways to have fun and even go out without blowing your budget and ruining your long-term greatness! It’s is SO much less expensive to invite people over than to go out. I could go out for coffee with a friend and spend a minimum of $5 or I could invite a friend over and we can make coffee for far less than that for both of us. If we go out to a restaurant with friends, we’ll easily spend $30 for just Austin and I. 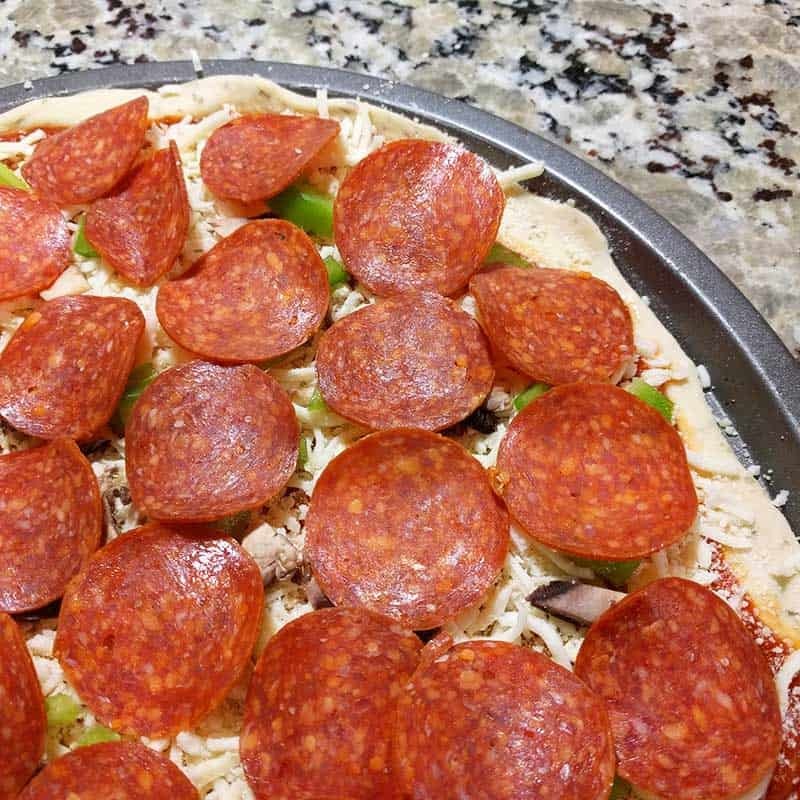 If we invite friends over, we can made something to feed everyone for $15 or less (love doing homemade pizza!). Plus, buying alcohol at a restaurant gets insanely expensive. Buying drinks to have at home is usually half the price. Going out to the movies usually costs $20 or more. We can have people over to watch a movie and make some really good snacks for $10. You get the idea. It’s expensive to go out. You can still be social and save money by inviting people over. When you do spend money, make sure you’e getting all of the cash back and rebates possible. My two favorite ways to do this are with Ebates and Ibotta because they’re so simple to use and hardly take any effort. Once I started using Ebates, I got mad at myself for not using it sooner because it’s so darn easy! Once you’re signed up, you literally just have to click a button to active cash back if you’re on a website that offers it. Then they mail you a check for your cash back! If you order anything online ever, it’s worth signing up, installing the Ebates button on your web browser, and activating the cash back if you’re ever shopping on a website that has cash back available. There’s also an app available if you usually shop from your phone or tablet. Click Here to Sign Up for Ebates. I highly recommend installing the Ebates button once you’re signed up so that it will tell you if the site you’re on has cash back available. Here’s the instructions on how to do it. Ibotta also makes it so easy to earn cash back! My absolute favorite part of Ibotta is that it allows me to earn cash back on store brands as well as fruits and veggies. The rebates available change weekly. Once you are ready to redeem you just have to take a picture of your receipt and sometimes scan the barcode on the item with the rebate. That’s it! It only take a few minutes to check the app and redeem rebates after a shopping trip which is what makes it worth it for me. Click here to sign up for Ibotta and you’ll get $10 added to your account when you redeem your first rebate. You might even have a receipt in your wallet right now that will work. I have a tutorial to help you get started. When we’ve paid off debt in the past, we’d cut a lot of the fun stuff out of our budget. To make up for this, we would find things around the house to sell so that we could have some fun money again. I know most people would say to use this extra money to pay off the debt, but when your budget is super tight, it’s nice to be able to find a way to earn money for something fun. If we sold something worth a lot of money, we would use part of it for fun and part of it towards our goal. If it was $10 or $20, we would most likely enjoy going out to eat or to the movies for a special treat. In the past, it has made us more motivated to sell things knowing that we would get to use that money for something fun. There is so much you can do for free wherever you live. I promise. It might be different activities than you’re used to, but there is a lot to do. In the city we live in, we can find free swing dancing nights, free yoga classes, tons of free kids’ activities, and much more. Take a look at this big list of free activities. Plus, do a Google search of the name of your city or county and the words “free activities”. You might be surprised at how many options are out there for adults, kids, and families. Hobbies can be a huge expense for a lot of people. Almost any hobbies can become extremely expensive if you let it, but that doesn’t have to be true. Sewing can be an expensive hobby if you buy pricey fabrics, want new machines and tools, and constantly buy new patterns. However, sewing can be a great money saving hobby if you alter your own clothes, shop clearance racks for fabric, and sew gifts for family and friends. While you’re in the middle of paying off debt, try focusing your time on hobbies that can save or make you money. Just be careful because any hobby can become a big expense if you always need the newest tools and materials. I wrote a whole post about 10 hobbies that will save you money. You might even make money wth a hobby if you sell what you make, start a blog, or take photos for others. We have gotten some great deals on Groupon that have allowed us to go out for a fraction of the usual price. It depends on your area what deals are available but even when we lived way out in the country, we were surprised to find local deals. I’ve seen deals for great restaurants, ice cream shops, bowling, golf, escape rooms, a murder mystery dinner, painting classes, and a whole bunch more! Using Groupon is a simple way to stretch the going out money that you budget for so that you can do more, even on a tighter budget. It can be ridiculous how much fun stuff we have that we forget to use! You don’t have to spend money on fun activities if you use what you already have. The apartment we lived in last winter had an indoor pool and it was crazy how empty it was almost every time we used it. No one took advantage of something fun that they were already paying for. We have video games that we haven’t finished, board games that we enjoy but haven’t played in years, and bikes that we don’t often ride. There are plenty of opportunities to have fun right in front of us. We just don’t always think about using what we already have. It can take a little bit of creativity to come up with ways to have fun without spending much money. For me, that can also be part of the fun! We’ve used all of the these strategies to achieve our financial goals without feeling deprived. 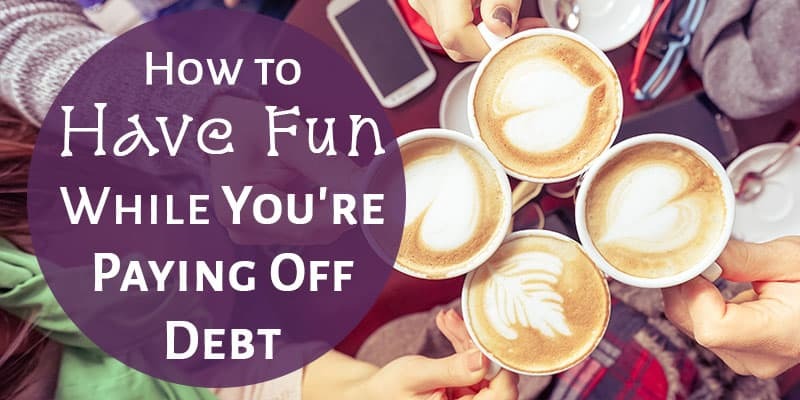 You can absolutely still have fun while paying off debt! ⇒ How do you have fun while paying off debt or on a super tight budget? These are great tips. I love the one about having people over……I often try to have a picnic because going out is just so expensive! I have a huge tent, and sometimes we sleep in our yard instead of driving to go camping. We can just use the potty inside our house as well. Plus we have a firepit and we burn all the pages of drawings we do from our homemade Pictionary set that we are too cheap to actually buy from the store. My husband and I love to go out on long walks during Fall and Winter. We used to stop off somewhere to get coffee/tea and a snack which can be expensive. I found two good travel mugs on sale and now I make the drinks at home and pack homemade snacks so we can still enjoy the day and save money. We wait for most movies to come on Netflix rather than the pricey cost of a theater ticket, plus homemade popcorn is much tastier! Thanks for sharing Annie! We love to go for walks in the fall and I love the idea of drinking snacks and a warm drink! It’s much cozier to watch movies at home. I’m always freezing at the theater and not quite comfy.